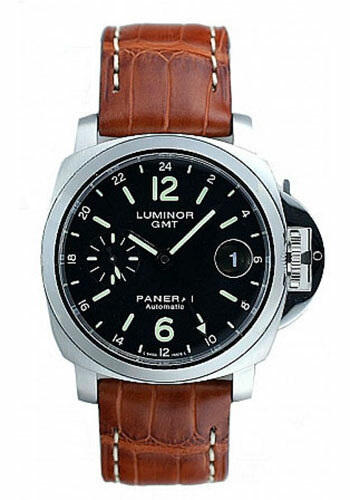 40mm AISI 316L brushed steel case, steel back, polished bezel, polished steel device protecting the crown, black dial with luminous Arabic numerals and markers, 24h indication on the edge, date at 3 o’clock, seconds at 9 o’clock, automatic Panerai OP VIII calibre movement with hours, minutes, small seconds, date, second time zone, approximately 42 hours of power reserve, brown alligator strap. Water resistant to 300 meters. 44mm AISI 316L brushed steel case, steel back, polished bezel, brushed steel device protecting the crown, black dial with luminous Arabic numerals and markers, 24h indication on the edge, date at 3 o’clock, seconds at 9 o’clock, automatic Panerai OP VIII calibre movement with hours, minutes, small seconds, date, second time zone, approximately 42 hours of power reserve brushed stainless steel bracelet. Water resistant to 300 meters. 44 mm polished AISI 316L stainless steel case, screw stainless steel back, brushed steel device protecting the crown, sapphire crystal formed of corundum, black dial with luminous Arabic numerals and markers, 24h indication on the edge, date at 3 o’clock, silver seconds subdial at 9 o’clock, OP XXXI calibre automatic movement with hours, minutes, small seconds, date, GMT, approximately 50 hours of power reserve, dark brown calf assolutamente strap with beige stitching. Water resistant to 30 bar.